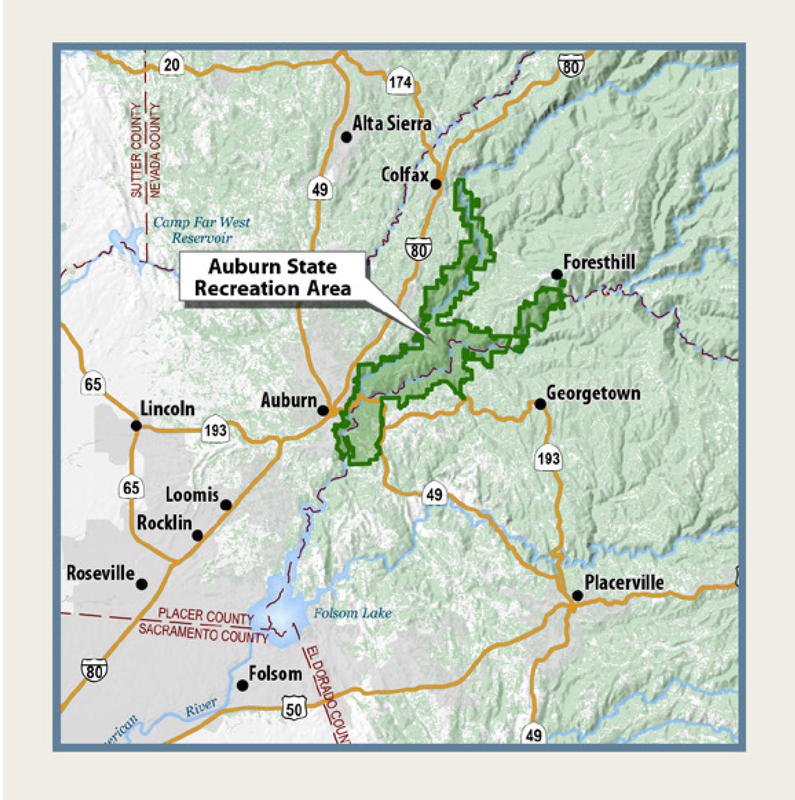 HELP PLAN THE FUTURE OF AUBURN STATE RECREATION AREA! SIGN UP FOR ASRA PLANNING NEWS BY SENDING YOUR NAME AND EMAIL ADDRESS TO: PLAN.GENERAL@PARKS.CA.GOV. Fact Sheets below provide detailed information about several topics that have been of particular interest to the public. Approximately 550 individuals and organizations shared their thoughts, questions or concerns about the draft proposed action. A full summary of public input is available here.(23MB). • Parking capacity to be increased by up to 25 percent. • Camping capacity to be increased by up to 245 individual campsites and five group sites. • River access improvements to trails, roads and boat landings. • Trail bridges over the North Fork American River between Auburn and Cool and over the Middle Fork American River at the former Greenwood Bridge site. • Increased natural and cultural resources management, including fire prevention strategies. • Increased opportunities for visitors to engage in stewardship and education opportunities. 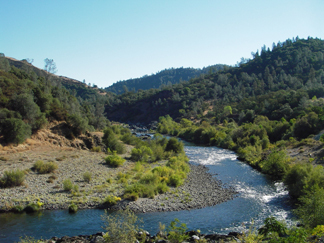 Auburn State Recreation Area (ASRA) is comprised of about 30,000 acres with forty miles of river canyon along the North and Middle Forks of the American River . California State Parks is collaborating with the U.S. Bureau of Reclamation (Reclamation) to prepare a joint ASRA General Plan/Auburn Public Lands (APL) Resource Management Plan (GP/RMP). California State Parks manages ASRA through a Managing Partner Agreement (MPA) with Reclamation. The GP/RMP will define a long term vision for the park unit, provide guidelines for the protection and management of natural and cultural resources, determine management of many recreation activities which will occur here, and identify any additional facility improvements. An Environmental Impact Report/Environmental Impact Statement (EIR/EIS) will be prepared as part of this project, to describe potential GP/RMP environmental effects. The GP/RMP is a programmatic document that will outline broad goals and guidelines for management of Auburn SRA and will provide the basis for developing future focused management plans, specific project plans, and other proposals which implement the GP/RMP goals. However, the GP/RMP will not define detailed methods, plans or designs for fulfilling these goals. The planning process will provide many opportunities for public involvement. ASRA GP/RMP Newsletter #1 below provides an overview of the public input process. Additional newsletters and planning documents will be posted on this webpage as they are available. The process relies heavily on public input in developing proposed actions, so three public meetings will be held before the plan is considered for adoption by the State Park and Recreation Commission. These meetings will allow the general public to express thoughts and opinions related to the future of the park. 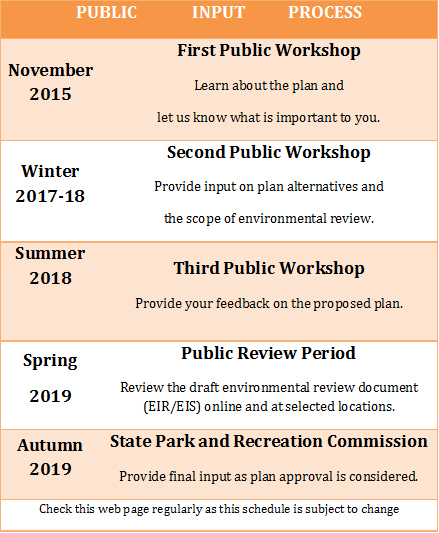 If you would like to be kept updated on public workshops and plan development, please submit your name and email address to Plan.General@parks.ca.gov. As allowed by law, email addresses will be kept confidential and only used in connection with ASRA issues, but your name and your comments will become public information. If you would like to be added to the mailing list to receive notification of future workshops and planning updates, please contact the project lead at plan.general@parks.ca.gov. If you need special accommodations to participate effectively, please contact us at least 48 hours in advance. California State Parks and the Bureau of Reclamation held an Alternatives and CEQA Scoping Open House on Thursday, December 7, 2017 at the Gold Country Fairgrounds Sierra Building, 209 Fairgate Road, Auburn CA 95603. Notice of Preparation. Environmental review scoping comments were accepted through January 5, 2018. ASRA GP/RMP Newsletter #1. November 2015. The existing planning document that provides guidance for the management of ASRA is a AUBURN SRA INTERIM RESOURCE MANAGEMENT PLAN 1992. This plan is outdated and does not adequately address the current types and levels of use at ASRA and other management needs. In recognition of the need for a new guidance document for ASRA, from 2005-2008 State Parks and Reclamation initiated a process to develop a new GP/RMP. Several public workshops and stakeholder meeting were held. This planning process was suspended in 2010 due to the uncertainty regarding the future management of ASRA. In 2012 Reclamation and State Parks entered into a new 25-year MPA for the federal lands at both ASRA and Folsom Lake SRA. With the future management of public use and recreation secured through the MPA, the two agencies both want to re-initiate a process to complete the GP/RMP. While this current process is not dependent on the documents or information developed in the 2005-2008 planning, that information will be used to help inform the current planning effort. Between April and June of 2006, members of the Planning Team for the Auburn SRA General Plan/Interim Resource Management Plan met with key project stakeholders in five, two-hour focused meetings. The goal of the meetings was to engage representatives of various user and interest groups in focused discussions prior to the initiation of the first public workshop in June. Participants were asked to identify what they were passionate about with regards to Auburn SRA; what special value or niche that Auburn SRA holds for them; and what issues, challenges or opportunities they believe the GP/IRMP needs to address. Below is a link to the notes from these focus group meetings. Four focus group meetings were held in April 2007 with representatives of a variety of user and interest groups. The goal of these two-hour meetings was to engage representatives of various user and interest groups in focused discussions prior to the initiation of the second public workshop in May 2007. These stakeholder meetings focused on soliciting ideas to resolve the key issues previously identified. As part of the information gathering for the General Plan an onsite visitor survey was conducted in 2006 to learn more about visitor use patterns and visitor preferences within Auburn SRA. Five hundred and twenty eight useable surveys were completed by visitors at a variety of locations throughout the SRA from May through October of 2006. See the report of the survey findings in the link below. The data from the survey and the findings will help inform the planning process. A special thanks to all of the volunteers from Canyon Keepers who helped implement the survey under the guidance of Aukerman, Hass and Associates, LLC. A statewide visitor survey in 2010 included Auburn SRA. Click here for this section of the report. If you would like to be added to the mailing list to receive notification of future workshops and planning updates, please contact the project lead at plan.general@parks.ca.gov. 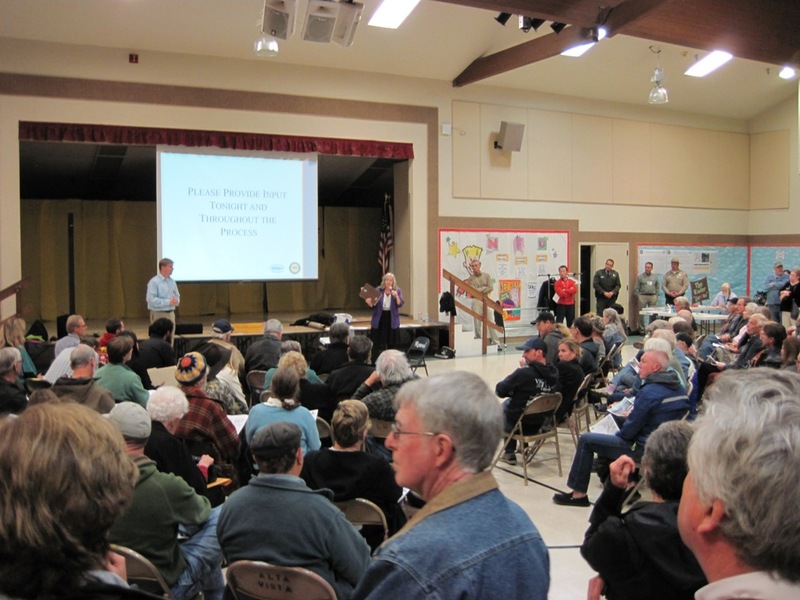 Thank you for your interest in the future of the Auburn State Recreation Area and participation in this planning effort.